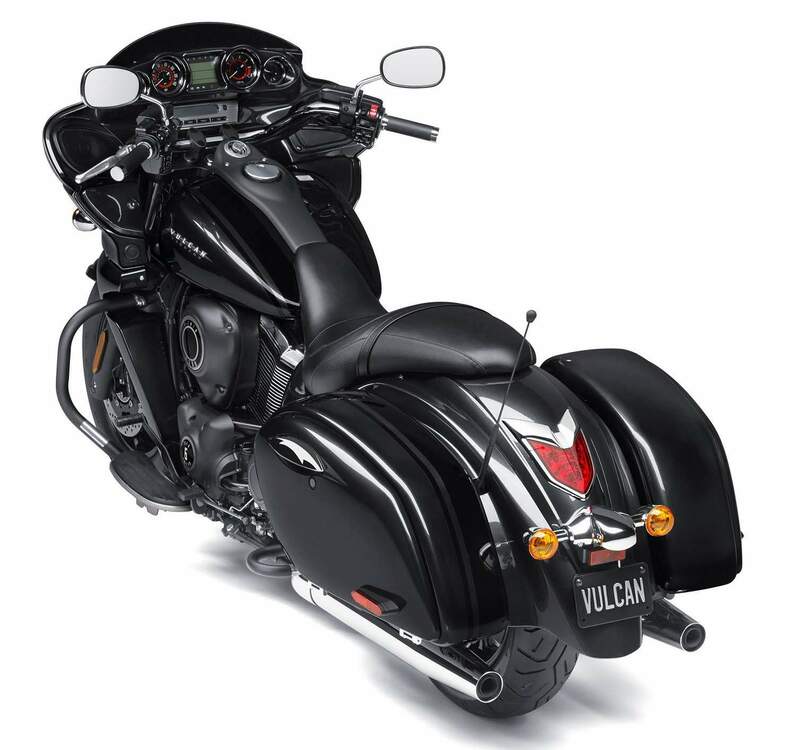 The Vulcan® 1700 Vaquero® is based on the Vulcan® 1700 Voyager® and it features many original-design components like the engine shrouds, side covers, rear fender, mufflers and side opening saddlebags. The Vaquero’s numerous blacked-out parts contribute to a hard, aggressive image. •Long stroke engine designed to deliver high levels of torque. •Liquid-cooled A/C generator reduces the temperature of generator stator coils and thus increases output to handle additional accessories. need for an oil tank. Triple oil pumps (2 scavenge and 1 feed pump) help reduce stirring loss and provide superb oil circulation. •Water jackets surround only the top quarter of the cylinders and the polished-edge fins match the cylinder heads while attractively tapering to the cylinder bases. •High-performance forged pistons(KP) are lightweight, stronger and more heat resistant than cast versions. Oil jets help cool the pistons for added durability. •Dual primary engine balancers (KP) and rubber engine mounts (KP) help isolate high-frequency vibration while providing the rider with the core power-pulse feeling of the muscular engine. •Single-pin crankshaft for that classic V-twin rumble and characteristic pulse. •Dual 42mm throttle bodies with Atomizing Fuel Injectors produce a fine fuel mist for better combustion and fuel consumption. •The throttle pulley operates an acceleration position sensor (APS) that uses the ECU to send a signal to a small motor that actually operates the throttle valves. 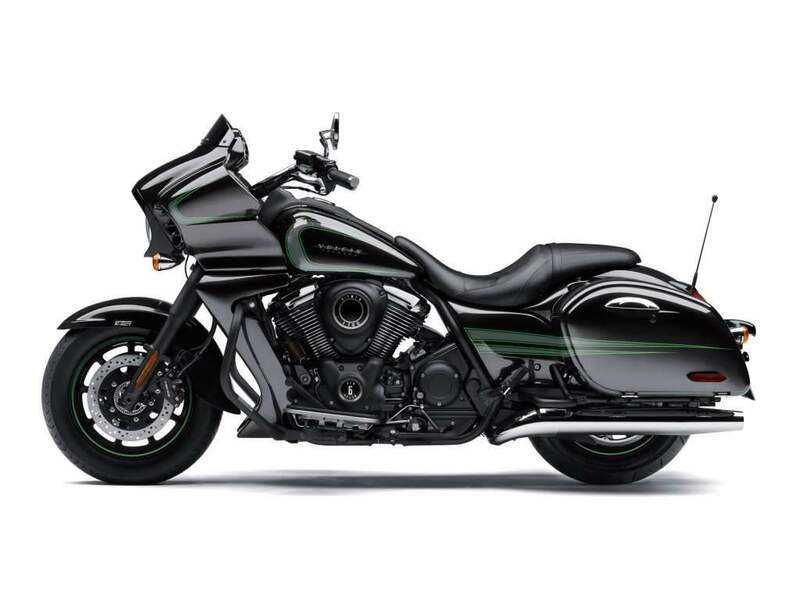 This makes throttle pull very light for reduced rider fatigue and the more precise throttle control results in better performance, smoother running and increased fuel mileage. •Using a cable-operated APS eliminates expensive switch housing electronics that can be damaged and costly to replace should the motorcycle get tipped on its right side. •Works in conjunction with the ETV to automatically maintain a set speed when in third gear or higher and when traveling between 30 and 85 mph. •Convenient controls located within easy thumb reach on the right handlebar. •Microprocessor controlled timing provides precise engine management. •Overdrive 6th gear reduces rpm at higher speeds and helps increase fuel mileage. •Gear position sensor communicates with the ECU to help reduce fuel consumption and adjust timing to provide better power feeling, and an indicator on the speedometer allows the rider to monitor current gear position at a glance. •Lower unsprung weight than shaft drive to improve ride quality and suspension action. •Carbon fiber belt provides much more strength than Kevlar while allowing the belt to be narrower. •More efficient so more power reaches the rear wheel. •Low maintenance and low noise. •Large steel box-section backbone frame is very rigid and helps contribute to high stability and lightweight handling at low speeds. •Low profile reduces seat height for an easier reach to the ground. •Air shocks provide a wide range of adjustment to match the load or riding preference. 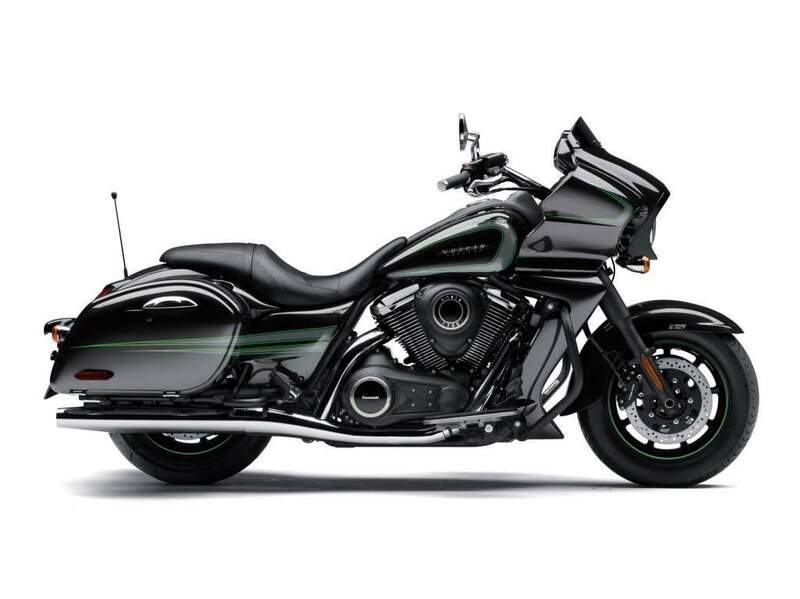 •Special spring rates to match the increased weight of the trunk and saddlebags. •K-ACT (Kawasaki Advanced Coactive-braking Technology) ABS is a linked brake system that ensures ideal brake force distribution for confident, highly effective braking. •Electronic system controls brake force distribution between the front and rear brakes to enhance overall braking performance, no matter how hard the front and/or rear brakes are applied. •Anti-lock Braking System (ABS) is incorporated into K-ACT to help prevent the wheels from locking during hard, straight-up braking for enhanced control. •For maximum controllability in tight corners or when making U-turns, K-ACT does not engage when braking is initiated at speeds below 12 mph. The ABS disengages at speeds below 4 mph. •Dual 300mm front discs and a single 300mm rear disc stop with authority. •Directs wind buffeting to the chassis to keep steering feel light and pure. •AM/FM tuner with front fairing-mounted 40-watt speakers is standard equipment. 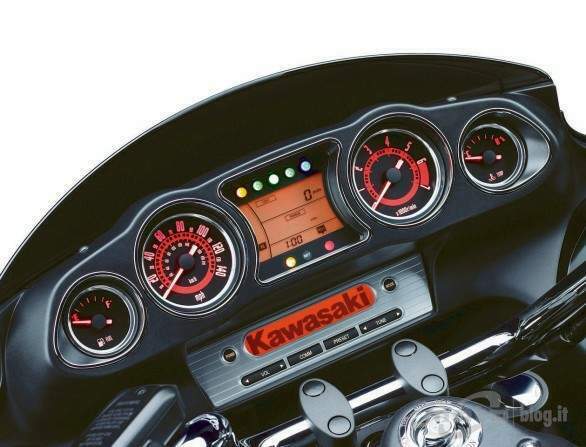 •Easy-to-use audio controls are located within easy thumb reach on the left handlebar. •Standard audio system is equipped to easily expand with optional iPod™, XM™ tuner and CB radio attachments. •Electric design reduces weight and eliminates the front wheel drive unit and cable for a cleaner look. •Analog instrument faces & evoke memories of the hot rods from the ‘60s. •Digital displays include odometer, trip meter, clock, fuel range and average mpg. •Gear position indicator makes it easy to determine which gear the transmission is in at a glance. •LED tail light provides excellent visibility when activated, and makes a strong visual statement with chrome surround. •Tank, seat, fenders, saddlebags and details designed with a classic 1960‘s feel. 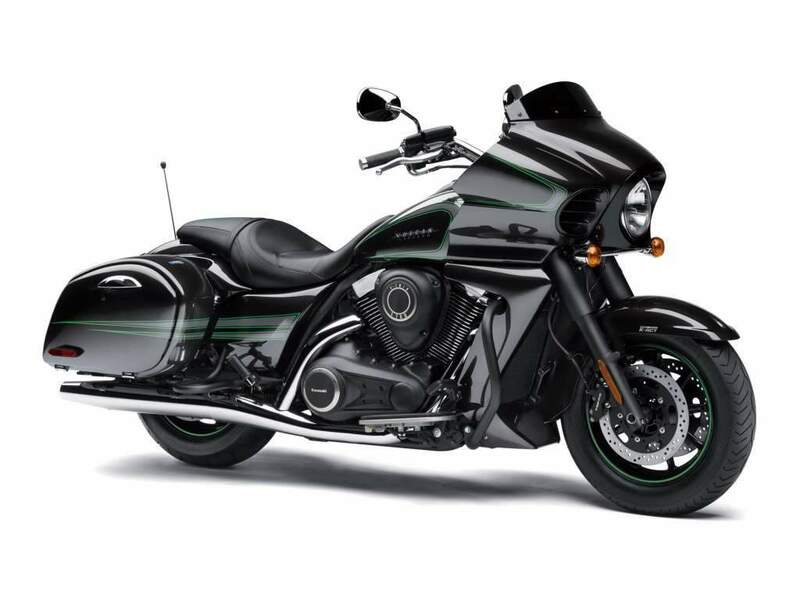 •Adjustable front brake and clutch levers and master cylinders enhance rider comfort and styling.